Story: Sherlock Holmes has made his reputation finding the truth at the heart of the most complex mysteries. With the aid of Dr. John Watson, his trusted ally, the renowned "consulting detective" is unequalled in his pursuit of criminals of every stripe, whether relying on his singular powers of observation, his remarkable deductive skills, or the blunt force of his fists. But now a storm is gathering over London, a threat unlike anything that Holmes has ever confronted - and just the challenge he's looking for. After a string of brutal, ritualistic murders, Holmes and Watson arrive just in time to save the latest victim and uncover the killer: the unrepentant Lord Blackwood. As he approaches his scheduled hanging, Blackwood - who has terrorized inmates and jailers alike with his seeming connection to dark and powerful forces - warns Holmes that death has no power over him and, in fact, his execution plays right into Blackwood's plans. And when, by all indications, Blackwood makes good on his promise, his apparent resurrection panics London and confounds Scotland Yard. But to Holmes, the game is afoot. Racing to stop Blackwood's deadly plot, Holmes and Watson plunge into a world of the dark arts and startling new technologies, where logic is sometimes the best crime- fighting weapon - but where a good right hook will often do the job. 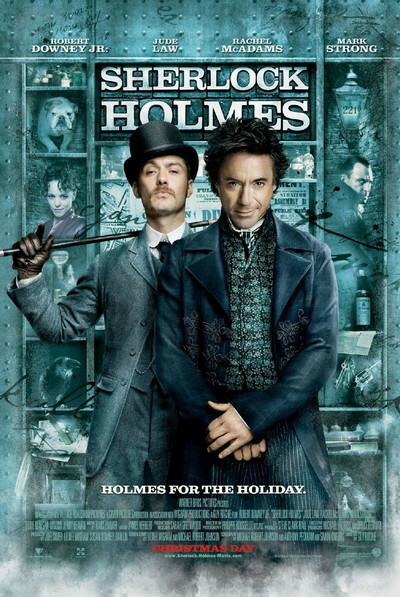 In a dynamic new portrayal of Sir Arthur Conan Doyle's most famous character, Robert Downey Jr. plays the legendary detective Sherlock Holmes. Revealing fighting skills as powerful as his famous intellect, Holmes employs his own unique methods to get to the heart of a case, traveling where no one else would think to go to find what others cannot see.